Just Jingle: CAS-ual Fridays Stamps and Imagine Crafts Blog Hop! CAS-ual Fridays Stamps and Imagine Crafts Blog Hop! Hello, all! Today the CAS-ual Fridays Stamps design team and the Imagine Crafts design team are coming together for a super fun blog hop with LOTS of inspiration for you! If you came from Monica Edwards' blog, you are already on the right track! If not, you may want to hope on back to the Imagine Crafts blog to start from the top of the list! I pulled together some fabulous stamps from CAS-ual Fridays Stamps and some of my favorite inks from Imagine Crafts to create this fun card! I stamped the Tin Roof background diagonally on the corners of my panel with Momento Tuxedo Black ink and then colored with Copics. I then stamped the sentiment from the MWAH! stamp set with Cardinal VersaColor pigment ink and clear embossed it with Clear Embossing Powder. Because I was able to stamp the sentiment in a bold color and emboss it for extra dimension, I was able to stamp it over the pattern without it getting lost. Be sure to leave a comment on my blog, along with the others along the way! CAS-ual Fridays Stamps is giving away a fabulous Gift Certificate and Imagine Crafts is offering a wonderful prize, too! YAY!!! Your next stop on the hop is Teresa Abajo! Happy Hopping! That's a fun stamp and nice coloring! Love this cute stamping at both of corners, looks like block printing! Beautiful! I so love this Tin roof stamp and the fun way you have only used it on the corners. I love your color choices. It looks great! Oh this is so pretty!! LOVE how you used that Tin Roof stamp in the corners. Looks so cool!! Love this stamp and the colors you chose...some of my favorites! Cute! I love the fun print in the corners and the sweet, simple sentiment. Clean and Simple, yet stunning. Great job. Love how you placed them in corners. I have a few VersaColor inks that are my go-tos. The way you've used them on this lovely card is awesome. Gorgeous! I love the color palette you used! I love the geometric look to your card ♥ TFS! Love the flowers in opposite corners. Fun card! Love that Tin Roof background design! Beautiful card Jennifer!! The background design is awesome I love learning these new techniques from you all. I'm still some what a newbie. Thanks for sharing. Love that close up with the shiny red sentiment! Makes me wish I could run my finger across it! Rich and decadent Jennifer! Such a fabulous card! Simply elegant! OH-MY-GOODNESS, HOW cute is THIS! Very clever Jennifer! Very cute. Loving the delicate flowers. I like how your bold sentiment travels through that sweet design! 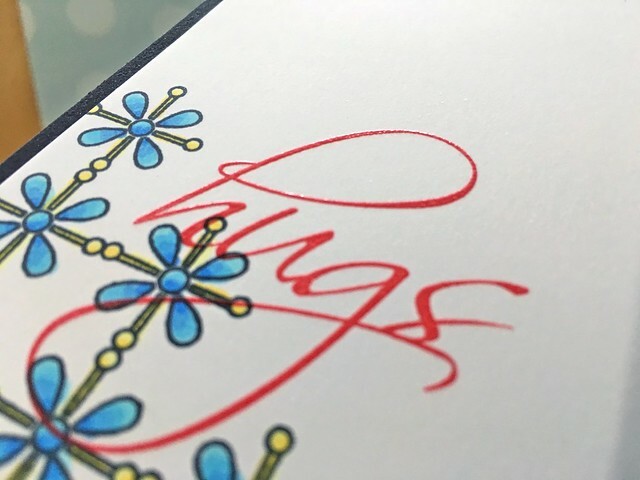 Such a pretty card - and don't you just love those inks??!! I love your card because it is clean and simple and very cute. What a great CAS card and I love the flowers with the pop of red! I love this card! Excellent idea! Thanks for sharing! I always love your CAS card designs. The red sentiment is adorable! Love how you stamped on the corners!! Great design. Love this corner design and the color combo, especially the Cardinal red ink! Such a fabulous card, Jingle! The red embossed sentiment is so striking! What a fantastic card - looks so cool and those touches of the black on the side really make this card shine!! I love your CAS design.